Fairborn hotel has a seasonal outdoor pool. Complimentary wireless Internet access is available in public areas. Guest parking is complimentary. Event facilities consist of conference/meeting rooms, small meeting rooms, and banquet facilities. Additional amenities include laundry facilities, coffee in the lobby, and RV and truck parking. 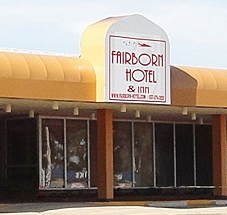 The 149 air-conditioned guestrooms at Fairborn hotel, include safes. Guests can choose from one and two bedroom suite accommodations with high-speed wireless Internet access, cable TV, and pool (seasonal). Guests can channel-surf the premium cable television. All accommodations provide desks and phones; free local calls are offered (restrictions may apply). In addition, amenities available include hair dryers, irons/ironing boards, and wake-up calls. Housekeeping is offered daily. Fairborn hotel is situated in Fairborn and area attractions include Wright State University and National Museum of the United States Air Force. Additional regional attractions include Boonshoft Museum of Discovery and Dayton Art Institute. Should you need any additional information, please feel free to ask! We are here to serve you!